The experience we have gained at World Port Development can be used to your advantage. The publishing activities of World Port Development have been developed rapidly to serve manufacturers, ports and transportation industry associations with books, maps, information documents and/or corporate literature at a more affordable price. Our publishing activities also include Newsletters, Publications and Directory publishing. Penetrating certain market sectors or updating confidential information can be a daunting task. Knowledge is the key to success. World Port Development can do the research for you. We have undertaken various research projects that have influenced and benefited sales & marketing strategies for our clients. Manufacturers often look for sales opportunities but can be lost in a maze of information. We can untangle information, analyse data and identify potential [new] opportunities and present this in a logical and easy-to-read report. From operational to financial issues and from gear boxes to ship-to-shore container cranes we can help you find the information you need to do better business! Does your Port Authority need a Port Handbook? Not sure who to contact? World Port Development can be your first 'port of call'. Our experienced and dedicated editorial team understands how a Port Authority works and can reflect this in a comprehensive publication. Employing a reflective and flexible approach, our team is here to serve your port. We are also able to arrange for distribution of your port handbook at conferences and/or exhibitions worldwide and implement various other marketing strategies which guarantee your publication the maximum exposure to the most relevant audience. 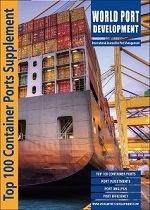 A Port Handbook can be an excellent marketing tool to promote your Port! Use the experience of World Port Development for your next Port Handbook and take advantage of our knowledge of the industry?